Sweet Balls made with semolina and sugar with the hint of cardamom. A spicy sour lemon rice from south Indian kitchen with appealing color and flavor. Lemon or lime both makes us to think more sensibly. Do you know what makes both to stand unique from each other? Not only the color as lemon in yellow and lime in green. A Gujarati Thali (here specifically Kathiyawadi) serves a basic traditional Gujarati cuisine. Gujarati cuisine is primarily pure vegetarian food. It contains all the famous authentic Gujarati food. Main dishes include Lasaniya Bateta and sev tameta nu sak, Bajra na rotla and thepla, khichdi kadhi accompnied by chili pickle and ghee gur. Hi Friends hope you all enjoyed this navaratri festival with most delightful and joyous way. Hope you all well aware of our guest hosted event Let's Pary - Prasadam / Prashad Special which is a brain child of Surabhi from MyCookBook. We received wonderful 58 entries each from different blogger friends and all are unique recipe to try. Some recipes are well known and few are new for us. It really gives us immense pleasure for receiving such a good response from people in this blogger world with such a wonderful encouragement. As this is our first event we are really glad to get such huge response and support from viewers and friends. Thank you all for the great support and keep following us as ever to come up with great collection of recipe. 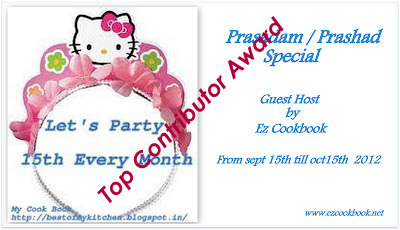 Without much ado here is the round up and winner announcement of Let's Party - Prasadam / Prasad Special event.The awards are categorized as Top Contributor Award, Best Recipe Award, Participant Award. Congratulation to all winners and participants... Be the first to flaunt your respective awards in your space. Jalebi is my DS's all time favourite sweet, I was planning to make it at home since long...Last week I saw this instant jalebi recipe on TV show and couldnt resist myself to make it at home.....I tried it for the first time and it came out so crispy and tasty though couldnt make proper shape..Learn how to make Instant Jalebi and read carefully tips given below recipe to avoid few common mistakes. Hope It will help you to make it better than me. One of the best neivedhyam for Navarathri would be this easy to make sweet rice. Any festival will always be complete with a sweet and this is one such sweet that can be made very easily. rice is cooked with milk and water first and then this rock sugar is added to add sweetness to it. This is also placed in variety rice category in South India for functions served for pregnant ladies. Lets see how it is made. Wishing all viewers and friends to enjoy this Navratri Festival with full of joy and delightful. Festivals are incomplete without delicious cuisines in India. As part of this navratri / Dussehra the first day I prepared this delicious green peas sundal as offering to god. This can be made with fresh green peas / dried / frozen peas depends on the availability. The green peas are cooked till soft. Sev Tameta nu Sak / Sev and Tomato Curry is a very famous sweet, sour and spicy curry. It is one of the most common curry served in Authentic Gujarati Thali in Highway Dhabas and restaurants. this curry is prepared with tomato, sev, and other Indian curry spices along with the sweet touch of jaggery or sugar. Make this tangy curry today and enjoy authentic Gujarati delicacy. Pickles are always something that we usual preserve for a long period and use it as required. This ginger pickle is same as such needs only 15 minutes to prepare. This can be preserved for a year. Pickle goes well with dosa, chappati / roti, curd rice. Sometimes I use to mix with steamed white rice and have with slice of raw onion. It has a special flavors it gets heat from hot red chilli powder, spice and flavor from ginger, strong flavor of garlic, sweetness from jaggery and tartness from tamarind. Parotta one of the famous south Indian Roti is always a treat for many people. The Parotta is made with a different process making rolls of the dough that is being elasticated. It is a daily food for many people in Tamil Nadu. I have heard people speaking of Parotta party as treats among friends. In my family this becomes a breakfast or dinner often and as a kid I have always loved and watched my granny or mom making the spirals with the dough. I would love to share this recipe with you people with step by step pictures. 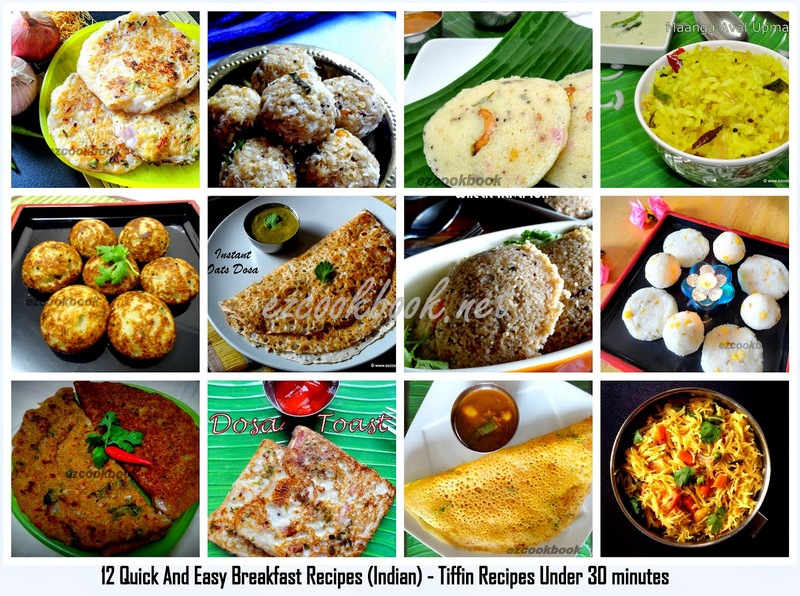 Today We wish to post the traditional Tamil Nadu breakfast recipes as part of our event Taste Of Tropics - Authentic Indian Platter. The main aim of hosting this event is to make you all aware of Indian regional cuisine. This include Idli, Dosa, Pongal, Vadai, Sambar and Chutney. Finally with aromatic filter coffee. To say about Tamilnadu and people who resides there. They are very famous for their hospitality( Virundhoombal) towards their guest. Tamilnadu is famous for both vegetarian and non vegetarian dishes. The dishes has great aroma and flavor with home ground spices and flavorings they use to mesmerism the taste buds. 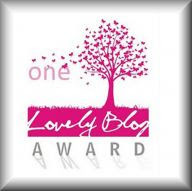 Happy and honoured to receive this lovely blog award from Saraniya of Sara's TastyBud. She is really an enthuastic blogger especially got impressed with her platter menu recipes. Friends do visit her blog for more interesting recipes. 2. Add the ONE LOVELY AWARD to your post. 4. Pass the award onto 15 nominees and let them know. 1. We are Stay at home mom's thats how we generally describe us as Wersahm. 2. Love cooking and love blogging. 3. We are shopping freaks but rarely buy for us. 4. Love To explore new things. Mutter Panner is a most favourite and evergreen dish of almong all North Indians. This dish is a most frequently ordered dish in North Indian Restaurant. "Mutter Paneer" as name says is a recipe in which soft paneer with green peas prepared in authentic punjabi tomato gravy. Try this authentic dish for your family today and enjoy healthy soft and creamy gravy. Dal Tadka is a signature delicacy from Punjab and very famous in all over India. It is a regular feature for most of us while eating out at a Punjabi restaurant. However few of us realize that this dish can be prepared with ease in your very own kitchen with split red and yellow lentils tempered with Punjabi spices and butter. It makes the perfect accompaniment to rice or Rotis. A healthy and creamy staple food as it is very rich in proteins and fiber. No lunch is complete without dal in almost all families of North India. Try this recipe by following this easy steps. Vattha Kuzhambu is a traditional treat in many south Indian homes. This authentic curry is a must in any south Indian Platter. Vattha Kuzhambu with Sutta appalam is a Heavenly combination which just melts inside our Mouth. Making of this Vatral Kuzhambu is also so easy. Its such a soft dish and pleasing dish for the stomach. Let me tell you the preparation for this easy to make dish. Hi friends , yesterday I posted Tiffin sambar but without main dish Idli / Dosa. Here is is the recipe for Idli / dosa batter preparation and how to make perfect homemade soft Idli? The staple South Indian breakfast is Idli / Dosa - a mother food . An ideal food that goes well with sambar and chutney off course with Idli Millagai podi. This post would be helpful to all kitchen noob. The batter for both Idli / Dosa preparation is same as well with the rice and urad dhal(lentil) combination of ratio 2:1. Tiffin sambar is a perfect side dish for all south Indian breakfast recipes like Idli, Dosa, Pongal, Vadai, Paniyaram, Uttappam, Upma. This is actually prepared in many ways but this procedure of preparing sambar for breakfast especially with Idli is my favorite from my mom's preparation. It will melt in mouth with Idli and ghee. The heavenly taste makes me to go back Home immediately and ask her prepare this for me. She is really an excellent cook and I am an ardent lover of her cooking. I want to dedicate this recipe for her.